At the moment I have a Bank of America account. I’ve probably been hit with about 3-4 charges by accidentally overdrawing more money than I have (at least in that certain account). I’m pretty tech-savvy, yet I absolutely hate the online dashboard. It’s slow, confusing, and makes banking a chore. You see, I truly want to have tight control over my finances (who doesn’t), yet there are so many different traps that await. If I don’t use my card, I’ll be charged. If I overdraw, I’ll be charged. It’s a maze, and I have no loyalty to Bank of America at all. Banking is a necessary evil, yet why aren’t there companies out there that try to simplify banking? It’s been something I’ve thought about for a while. I think startups are hesitant to challenge “the big guns” because there are countless laws and regulations – where is the freedom to innovate? Also, why can’t 99% of banking be done online? All I need is an ATM for cash, and that’s only 2x/month. Simple is a new way to bank. 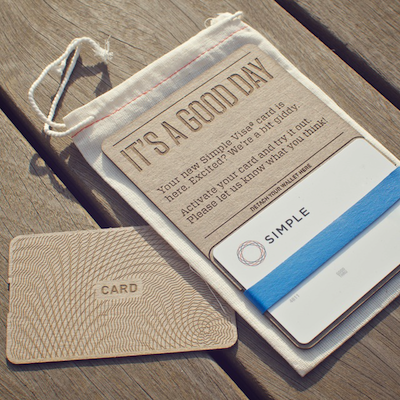 Utilizing technology and user-friendly design, Simple seems to be an answer to my desperation with banking. Simple hasn’t launched yet, but they do have some beta users at the moment. There’s not a lot of information on what the backend is like, but this video gives a decent explanation of what they have been working on. What about Laws & Regulations? “Simple is not a bank. Simple replaces your bank. We give you the services and support you need to manage, understand, and automate your everyday spending and saving. Meanwhile, your cash is deposited with our bank partners in FDIC-insured products. How does Simple make Money? Simple makes money in two ways. The first is interest margin, which is split between the partner bank and Simple. Next, they make money off interchange, which is revenue earned from the purchases made with the bank’s card. This is also split with the partnering bank. Since Simple doesn’t have physical locations, it enables them to have much lower overhead, and no hidden fees are the result. Have a check? Just take a photo of it with your smartphone and the check will be deposited by our bank partner into your account. Piece of cake. Of course, you can also mail in a check or money order. In the future, we may offer desktop scanning of checks as well. Simple also has (what appears to be), an extremely user-friendly app. Also, if you didn’t get a chance to watch the video, Simple has an intuitive way of searching back through past transactions (which are geo-targeted). You can also setup goals and set aside money for upcoming expenditures (something I still haven’t found out how to do with Bank of America’s online banking). Over the past few years, banking has caused quite a bit of controversy; from the housing market bubble to Occupy Wall Street, banking must change. Simple has over 90,000 people waiting in line, and I see this company exploding in 2012. There’s never been a more opportune time to disrupt banking, and Simple will do just that! Can someone give me a beta-invite? PLEASE?